The project title "Study of Solar Pond & Fabrication of Solar Pond Model" is a Mechanical project and focus on harnessing solar energy and then saving it for future use. A solar pond can be defined as a tank of water that collects and stores solar energy. Solar energy will warm a body of water as it is exposed to the Sun and than this heat energy of water is trapped to store it. You can also Subscribe to FINAL YEAR PROJECT'S by Email for more such projects and seminar. We all know that the sun is the largest source of renewable energy and this energy is available in large quantity at all parts of the earth. An this this fact make it one of the best alternatives to the non-renewable sources of energy. A solar pond is a body of water that collects and stores thermal energy. A solar pond can be used for various applications such as process heating desalination, refrigeration, drying, and solar power generation. Most of the solar thermal energy systems nowadays manufacture heat through raising the temperature of water within the collector by solar irradiation associated pumping it then to an external storage tank. A solar pond combines these two functions which makes the solar pond a cheap and simple system to produce and to store heat. There are two varieties of solar ponds to be mentioned, convecting and non-convecting solar ponds. 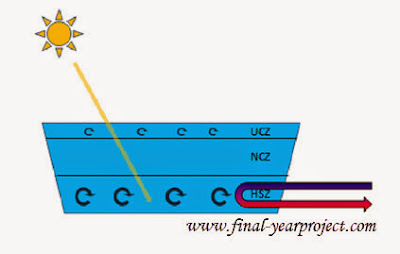 The non-convecting solar ponds are named like this because of their non-convecting zone (NCZ) which is formed between the upper convective zone (UCZ) and the heat storage zone (HSZ). Both varieties of solar ponds inhibit heat transfer by convection and evaporation from the system to the environment to limit heat losses. In most cases, this can be allotted by covering the surface of the heat storing part or by encapsulating the heat storing element how it is implemented in shallow solar ponds.